We always knew Sonjui Kumar, one of KPPB LAW’s founding partners, was a cool girl. And now she’s being recognized for it! 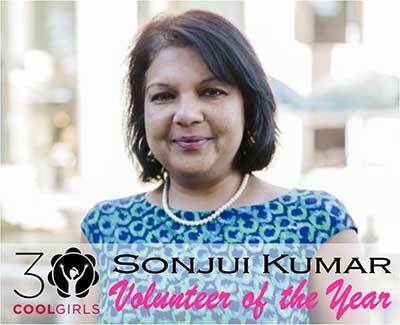 Cool Girls Inc. has named Sonjui as its 2019 Volunteer of the Year. Aside from Sonjui’s corporate law practice, she has been helping middle and elementary school girls learn to code for the past five years. In 2015, Sonjui introduced the 20-week program developed by New York-based “Girls Who Code” to Cool Girls’ after-school clubs in East Atlanta schools. Since then, the program has empowered more than 100 girls with technical knowledge and skills to create software programs, animate objects, or just understand how any process can be automated using easy to learn programming. Congratulations Sonjui for making a difference in the lives of young girls and for your recognition as Cool Girls Inc.’s 2019 Volunteer of the Year. If you would like more information about Cool Girls, its after school coding clubs, contact Tanya Egins at t.egins@thecoolgirls.org. If you would like to attend the Cool Girls 30th Annual “Hot Pink Party” fundraiser on April 13 in Atlanta, when Sonjui will be celebrated, click here.